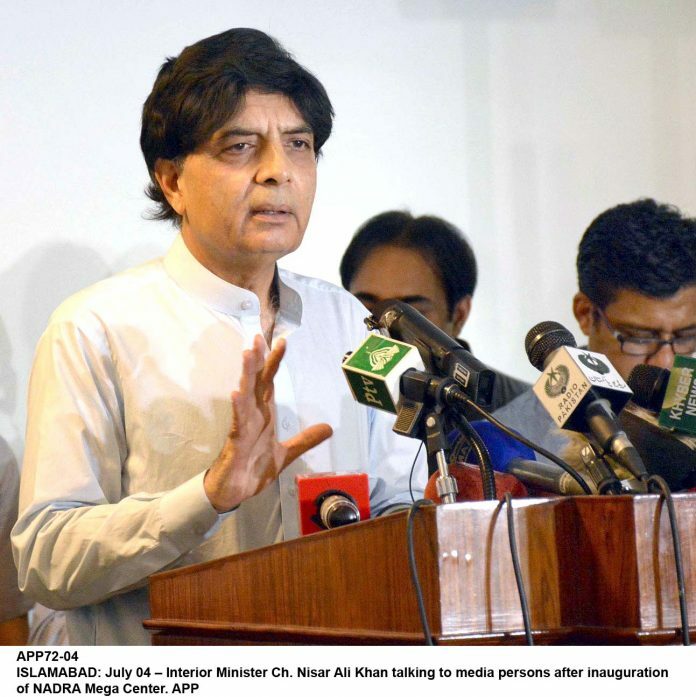 ISLAMABAD, Aug 16 (APP): Minister for Interior, Chaudhry Nisar Ali Khan on Tuesday said that action was being taken against the officials who committed negligence in issuing visa to deported US citizen Matthew Barrett. Replying to a point of order of MNA Dr Shereen Mazari in the National Assembly, the minister said action has also been taken against the FIA official who committed negligence in granting entry to Matthew Barrett. He said that the official who identified him, was given appreciation and cash prize of Rs 100,000 while clarification was sought from DG Immigration and DG FIA. He said that the American national was deported in 2011 from the country. Despite this, Matthew was issued visa by Pakistani Consulate in Houston within 24 hours, he added. The minister said that the Matthew Barrett didn’t fill many sections of visa form while in some places he replied both ‘Yes’ and ‘No’. He added investigation was being conducted in this regard. He said that a Joint Investigation Team’s (JIT) findings did not suggest that Matthew Barrett was a spy. His wife is Pakistani and he has two children who left Pakistan in 2011 when he was deported. He said that deported American national, Matthew Barrett was arrested by security personnel in 2011 from Fatah Jang. He said his father-in-law who was a lawyer defended him in the Supreme Court but he was deported on the order of the Supreme Court. Replying to a question of MNA Dr Arif Alvi regarding updates on Quetta incident, Ch Nisar said that some people have been arrested and monitoring was being done on daily basis. as of a person from Pashin who was also one victim of Quetta blast. invited in the meeting under the chairmanship of the prime minister. He said that out of 20 points of NAP, nine were directly related with the provinces while eight were with the federal government ministries. He said that there will be better outcome of leadership level meeting on NAP as things will be discussed and responsibilities will be assigned.